You can plug six AC adapters and two USB cables into this cleverly designed unit. 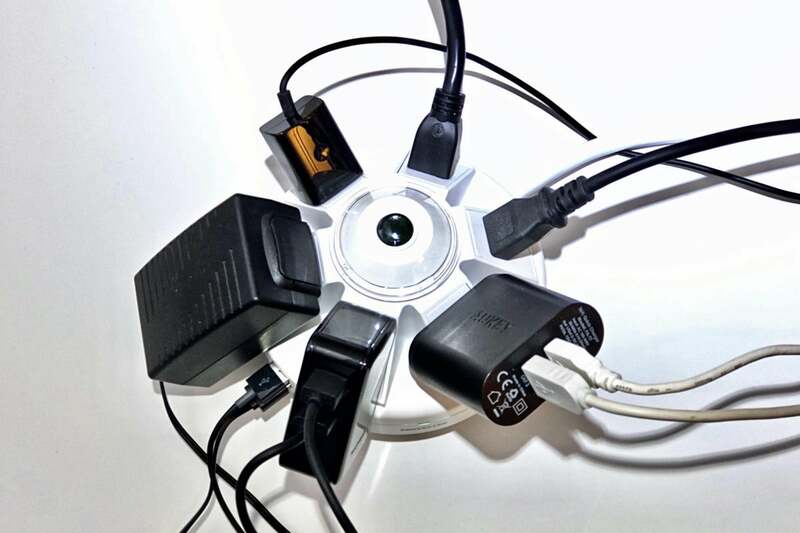 When you’re on the road, in a hotel room, at a coffeeshop, in an airport, or in a conference or banquet room, the power outlets available often fall far short of what you need. The Accell 6-outlet Powramid has a cutesy name, but packs a wallop. With six outlets spaced at intervals around a circle, plus two high-speed USB charging ports, you can practically power an office. You’ll make a lot of friends when you plug this in. The Powramid isn’t precisely portable. It’s just under 1.5 pounds and with the bulbous main unit plus the six-foot cord, so you won’t want to drop it into a laptop bag or a regular carry-on. But it is the kind of gadget you might throw into a car or in checked luggage if you’re routinely short of power or traveling with colleagues. It’s also a very reasonable choice for a household that has a lot of charging needs where adapters are frequently plugged and unplugged. It works nicely on a surface, but it doesn’t have the right shape to be tucked behind a desk or cabinet. The six outlets are spaced widely enough to let you plug in AC bricks and adapters; I have a few multi-port USB adapters that let me push USB recharging up to family or work team level, and they all slotted in just fine. The USB ports offer up to 2.1 amps (A) total, available to each port or shared between them if you have two devices that accept faster charging than 1A each. 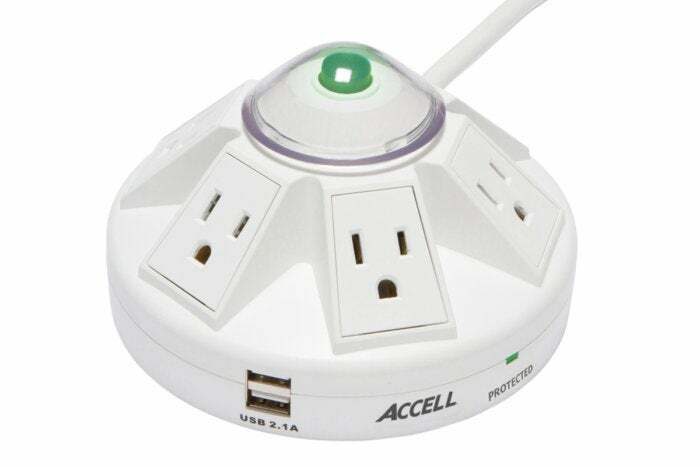 The Accell Pyramid’s unconventional design enables it to host a lot of AC adapters at once, and you can charge two additional devices with USB cables. The clamping voltages are fine, if not great, with 400V on the line-neutral (L-N) leg and 500V on the other two. The unit offers 1080 joules of durability, which corresponds well to that degree of clamping. Once protection ends, you’ll need to keep your eyes peeled for the Protected light’s status, as power will continue to flow. The one awkward element of the Powramid is its power switch: it’s contained under a clear plastic dome, which you have to use some effort to pull off and depress the switch, which, despite being translucent, didn’t light up on the model I received for testing. The cover, on the other hand, prevents it from being accidentally switched on or off. Accell offers a 5-year, $100,000 equipment damage warranty only to the original purchaser. The details aren’t online, but found them in a warranty insert with the product. Because of the Powramid’s two USB ports, you get the equivalent of eight outlets instead of just six. If you travel with a lot of devices that require power and charging, especially via USB, and especially in a group of family, friends, or colleagues, the Accell Powramid could be very worthwhile, sharing a scarce or hard to reach AC outlet with many others. The same is true in a home, where a kitchen counter or other surface is where you already have a profusion of adapters and USB cords—or people are constantly unplugging one to make room for theirs. Share and enjoy.